PENNYWISE, like all Wellingtons, is an exceptionally well constructed blue water cruising boat. With stunning Honduras mahogany joinery below deck, her accommodations are warm and welcoming while her raised salon bathes the interior in natural light. With a newly rebuilt 77 HP Yanmar diesel engine, she easily cruises at 7 knots under power and with a powerful ketch rig she is also remarkably fast under sail. 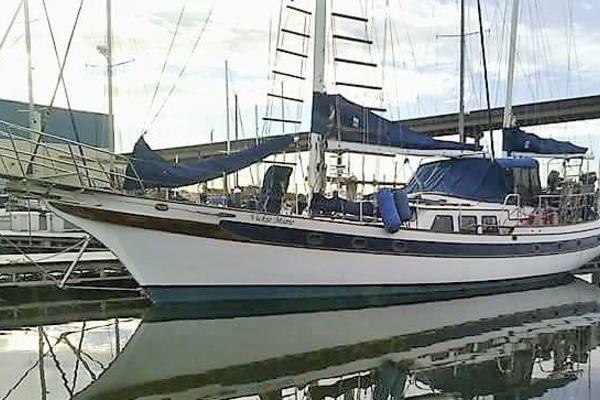 The perfect live aboard and/or long range cruiser, PENNYWISE is now in Fort Lauderdale and seriously for sale. Built in the U.S. to rigorous Bill Wellington specifications. Rebuilt 77 HP Yanmar diesel in walk-in full-size engine room. Oversized private master stateroom aft with ensuite head. Roomy main salon and galley layout that is perfect for entertaining. Shoal draft with centerboard for easy island cruising. 4'3" with board up. More than enough storage space to provision for long-range cruising. Bottom renewed and painted in 2017. PENNYWISE has an exceptionally comfortable and roomy 2-cabin 2-head layout. Steeping into the main cabin from the companionway her well-equipped U-shaped galley is to port with built in refrigeration and freezer to starboard. Her roomy salon can easily seat six around a lovely teak drop-leaf dinette table - which can be removed to create a third double berth. Above the settee to starboard is a 32" flat screen television. Moving forward is the guest head with separate shower to port and the generous vee-berth. The oversized master stateroom with a full-sized queen centerline berth is aft with a private ensuite head. The head also serves as passage to the walk-in engine room with full access and headroom. PENNYWISE cabins are cooled by a dual A/C system with a 16.5 BTU unit in the main salon and a 12K BTU unit in the master stateroom. The galley is equipped with propane 3-burner stove with oven to port.There is a double stainless steel sink surrounded by plenty of counter space and storage. The separate refrigerator and freezer are to starboard and are cooled by Adler Barbour 110V cold plates that easily last for 3 days before recharging. PENNYWISE is a cutter/ketch rig. Her mainsail is equipped with in-mast furling. Her headsail include a roller furling yankee, a retractable inner forestay and a hank-on staysail. The mizzen is a standard slide-on sail. There is also a mizzen staysail for excellent performance downwind. PENNYWISE carries a 80 LB Bruce anchor with 300 feet of galvanized chain and an electric windlass. Her second anchor is a stainless CQR with a nylon rode. The present owner re-powered PENNYWISE is 2015 with a rebuilt 77 HP Yanmar 4JHDTE Deluxe Turbo in 2015 which has fewer than 250 hours of usage. Also in the walk-in engine room is a Lister Petter 6.5 KW diesel powered generator.